Jinshanling is the start of the classic Great Wall hike to Simatai that Great Wall Adventure Club has guided to thousands of international travelers and adventurers. Often this hike is a foreign hiker’s first introduction to the Great Wall, so get off on the right foot with Great Wall Adventure Club. If you are daring enough to finish the hike, you will earn a spot on our hallowed Hall of Fame! Jinshanling Great Wall is located in Luanping County of Chengde, Hebei Province, and borders on Miyun County of Beijing Municipality. It is 130 kms away from Beijing. Jinshanling Great Wall was builit in 1567-1586 when Qi Jiguang, a famous general in Ming Dynasty, acted as the head of military force in Ji Town. It is typical in structure and is famous for its broad field of vision, dense guard towers, unique landscape, elegant architecture, complete military defense system and excellent state of preservation. It is an exemplary section of the Great Wall and hence comes the saying that Jinshan section is the most quintessential of the 10,000-li Great Wall. 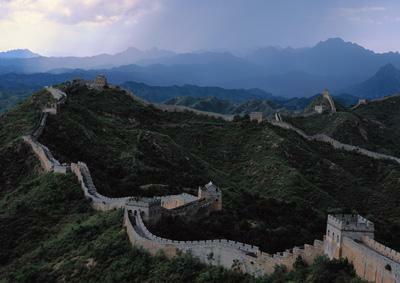 Jinshangling Great Wall got its name because it was built on the bigger and the smaller Jinshan Mountains. The Wall starts from Longyukou in the west and ends at the Wangjinglou Tower in the east and stretches about 10.5 kms. You can see parapets, kylin screen walls, literal bricks and wall made of literal bricks in Jinshanling. Jinshanling was listed as one of the world cultural heritage sites in 1987. It is also one of the AAAA-grade national tourist attractions of China.